Welcome to the 2019 Puppy Bowl! This year’s Puppy Bowl will be the 15th year of puppy fun! So get your purses and pocketbooks ready for the Puppy Bowl XV! There are two teams comPETing (see what I did there) in the puppy bowl, Team Fluff and Team Ruff. Not only will there be a puppy bowl but, a kitten bowl also takes place. The teams in the kitten bowl are the Little Longtails and the Last Hope Lions. All of the animals showcased in the puppy and kitten bowl are up for adoption. Get ready to act fast for the Puppy-Kitten Bowl! The first fourteen bowls have featured more than 500 adoptable puppies and kittens. This year, 93 puppies are featured, and they will come from 51 shelters from over 20 different states. The puppy bowl starts at 3 p.m EST time. Expect to hear lots of puppy puns if you tune into this year’s puppy bowl. The “ruffaree” Dan Schachner will host the puppy bowl. This will be his eighth year hosting the puppy bowl. As for the Kitten Bowl, Beth Stern is hosting. The kitten bowl will start at 2 p.m ET/PT time. The kittens will be competing for the National Championship of Feline Football trophy. 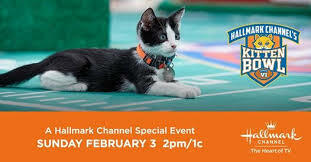 Beth Stern is a returning host for this years kitten bowl. Beth Stern is joined by Dean Cain as well as the former NFL player, Rodney Peete. There is a lot hanging in the balance of this years kitten/puppy bowl. Who will win the Fluffs or the Ruffs; The Little Longtails or the Last Hope Lions? You will have to watch to find out so tune in!